If you stand in front of the Butake chair, it may seem as if it is composed of pixels. Yes, there is the impact of the digital age, the forms of which are increasingly used in the design. 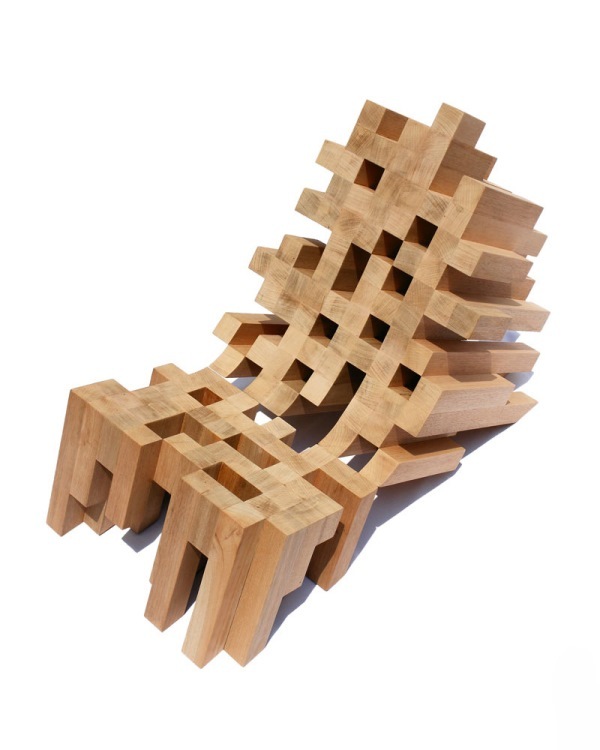 Designer Raul Tellez Herrera from Arquiteknia company has created a pixel chair called Butake, which surprises with its unusual irregular shape. From the front we see the illusion of depth and size of the product. And when we look at the chair from other sides, we can evaluate its unique shape. 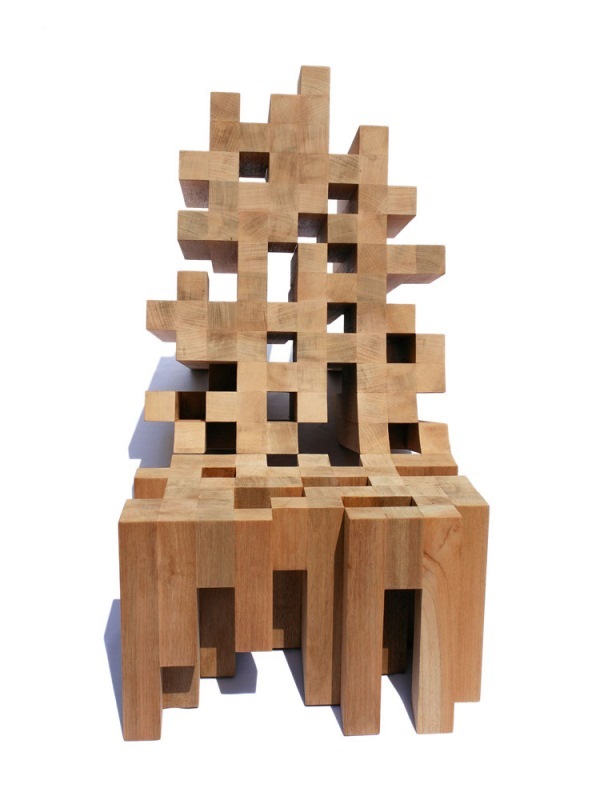 Raul Tellez Herrera has chosen Banak wood (a sort of South American hardwood) as a material for the chair. The wood was used without decorative finishes, while maintaining a natural material with all the details, grainy texture and natural shades. Chaotic set of bars from a South American hardwood were set at an angle to the vertical. They form the seat and the back of the chair. 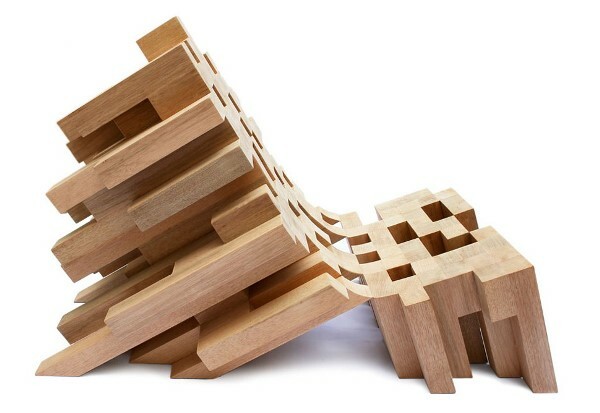 The Butake chair looks more complicated, if you compare it with the Peak puzzle chair of plywood. The designer combines modern form with the ancient material, wood, revealing its true natural beauty. To ensure sufficient rigidity of the stool there is a hidden metallic frame inside the chair. The resulting form is a kind of interpretation of modern digital technologies. During the manufacture of the Butake chair the designer did not use additional finish, allowing it to stay natural with beautiful pattern and color of the wood. The Butake chair is closely linked with the well-known Butaque chair, which became widespread in Mexico, the U.S. , the Caribbean, and other countries in the region. This chair also has an exotic design, the characteristic slope of the wooden frame and a leather seat. This design is ideal for the tropical climate of the region. Its descendant Butake, created by Raul Tellez Herrera, has kept almost the same shape, however, it is very different from its classical prototype. The “kinship” of these two chairs is immediately traced though the Butake chair stands out for its modern and innovative appearance, while remaining comfortable for rest and relaxation. Arquiteknia is an architectural firm, located in San Andres Cholula, Puebla, Mexico.